Garmin echoMap 50dv has an average rating of 4 out of 5 based on 3 user reviews. The Garmin echoMAP 50dv has a 5-inch display, which provides VGA-quality imaging. Built into the echoMAP 50dv is Garmin’s trademarked High-Definition Identification target tracking technology. Better known as HD-ID, it provides a super clear image of the area under the boat. 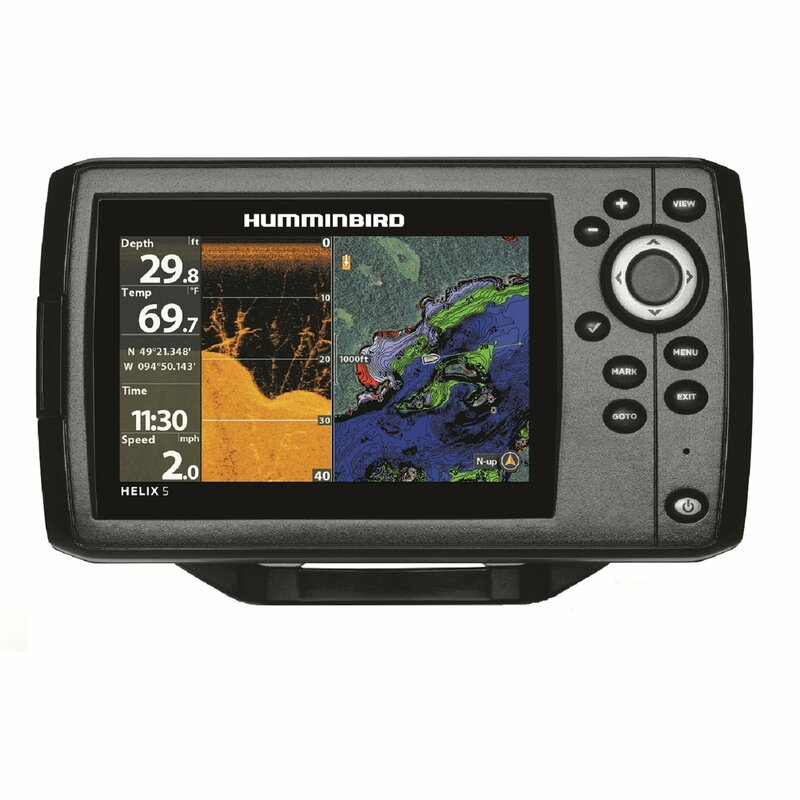 Garmin echoMap 50dv combines HD-ID with the DownVü scanning sonar, which provides a virtually photographic view of structure in the water. The built-in GPS receiver on the Garmin echoMAP 50dv has a speed of 10 Hz which allows it to update position 10 times a second. The higher update frequency results in more fluid boat movement display. Also included is sonar-recording capability for coordinating the timing of the sonar return with your boat’s position. You can playback your sonar recording on a PC with HomePort software or send it wirelessly to an Apple device equipped with BlueChart Mobile software. The Garmin echoMAP 50dv comes pre-loaded LakeVu HD map package, which provides details of 17,000-plus US lakes; or the BlueChart g2 coastal map package. The 50dv is capable of storing up to 5,000 waypoints and 100 routes. It also has a track log capacity of 50,000 points, with 50 saved tracks. The unit is equipped with two microSD cards for expanding the built-in flash memory and additional cartography. Garmin echoMAP 50dv comes with the transducer, power and data cable, tilt and swivel mount, flush mount, protective cover, and a user manual. You can get a great deal on Garmin echoMap 50dv here. I was about to buy echoMap 50s when Garmin announced echoMap 50dv. Having down imaging was an enticing proposition and I decided to wait until 50dv comes out. It was worth the wait. I’ve been using this fishfinder for couple weeks now and I think it’s a really great unit. I often find myself in a situation where I have to refer to the down image to figure out what 2d graph is showing, without down imaging I would be guessing. With the 2 graphs side-by-side I have the full picture. A fair unit, with some serious flaws. The automatic range control software is faulty, in that the sonar frequently pegs at the greatest depth, and won’t let go of that setting. I’m in 11 feet of water, and the unit sets the range to maximum. There is some other glitch associated with this phenomenon, because the digital depth display flashes that the unit can’t determine where the bottom is. I can stop this nonsense by selecting range manually, and set it to 15 feet. Then the unit snaps out of its stupor and starts working correctly. The second serious flaw is that you cannot set your favorite settings and have them stored as the defaults. That is a serious deficit.